Gold cake with chocolate frosting is mother’s favorite cake combination. I’ve had my eye on Hershey’s “Perfectly Chocolate” Chocolate Frosting for awhile now, and Mother’s Day seemed like the perfect opportunity to try it out. I had really hoped that it would be delicious, because I really wanted her to enjoy her Mother’s Day dessert. This recipe did not disappoint! The frosting is rich and chocolate-y with a fudge-like flavor. It’s a snap to make and spreads quite easily on the cake. The recipe makes enoug frosting to frost and decorate a 9-inch round layer cake with some to spare. The extra frosting is fantastic by the spoonful. 3. Alternately add powdered sugar and milk, beating to spreading consistency. Add small amount additional milk, if needed. 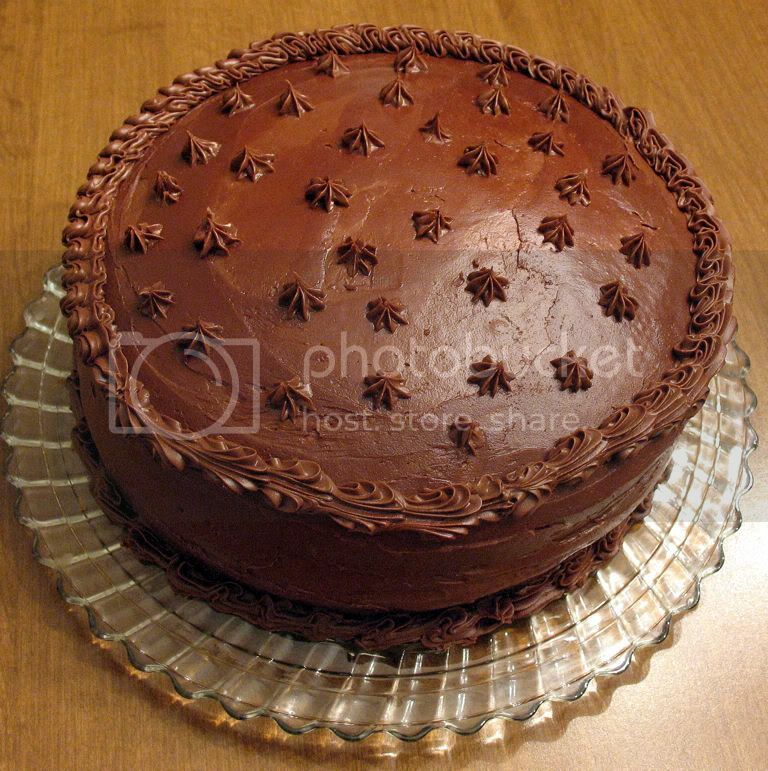 This looks sooo good…Was it tough to get the frosting to look so decorative and even? The frosting was quite smooth and spreadable, so it was pretty easy to get an even finish when I frosted the cake. It was a little smoother than it should have been for piping. I had a tough time controlling it along the border – if you look closely, you’ll see that it was uneven. If I added a little less milk, I think the frosting still would have been easy to spread, but would have been better for piping decorations. hey, ur cake looks awesome! i just love ur decorations..
could u tell me how u did the borders? it looks really hard, but i would appreciate it if u would tell me how u did such complicated patterns? Good job on this recipe and the finished product look great. I will have to try this for a birthday party this weekend. This is the best icing i have ever made! a good tip is to replace the hershey coco powder with godiva coco powder!!!!!!! !